Mark Singleton teaches at St. John’s College, Santa Fe, New Mexico. He is the editor, with Jean Bryne, of Yoga in the Modern World: Contemporary Perspectives. 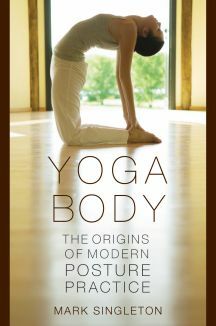 In his new book, Yoga Body: The Origins of Modern Posture Practice, he questions commonly held beliefs about the nature and origins of postural yoga and suggests a radically new way of understanding the meaning of yoga as it is practiced by millions of people across the world today. In the excerpt below, Singleton introduces the reader to Hatha Yoga. The techniques and philosophical frameworks of the Saiva Tantras form the basis for the teaching of hatha yoga, which flourished from the thirteenth century CE and which entered its decline in the eighteenth…The term hatha means “forceful” or “violent,” but it is also interpreted to indicate the union of the internal sun (ha) and moon (tha), which symbolically indicates the goal of the system…As Mallinson…has noted, the corpus of hatha yoga is not doctrinally whole and does not “belong” to any one single school of Indian thought. It is nevertheless closely associated with Goraksanãth and his teacher Matsyendranãth, who is credited with founding the Saiva Nãth sampradãya (twelfth century CE?). In practice, however, there was a high level of orthopractical and organizational fluidity between the Nãths (also called Kãnphata, or “split eared”) and other yoga-practicing groups. The yoga-practicing tyãgis of the Vaisnava Rãmãnandis, for example, were closer to the Nãths in terms of ritual and religious experience than to their devotionally inclined (rasik) Rãmãandi brethen…; close organizational trade ties obtained between Nãths, Sufi fakirs, and Dasnãmi samnyãsins, and there was a great deal of interchange between these various groups…; and at least until the late 1800s, Nãth yogins recruited novitiates without regard for caste or religion, attracting many Muslim yogins into their fold…This all contributed to a permeability among hatha yoga practicing groups. Hatha yoga is concerned with the transmutation of the human body into a vessel immune from mortal decay. GhS compares the body to an unbaked earthenware pot which must be baked in the fires of yoga to purify it and even refers to this system as the “yoga of the pot” (ghatasthayoga) rather than hatha yoga. A preliminary stage of the hatha discipline is the six purifications (satkarmas), which are (with some variation between texts) (1) dhauti, or the cleansing of the stomach by means of swallowing a long, narrow strip of cloth; (2)basti, or “yogic enema,” effected by sucking water into the colon by means of an abdominal vacuum technique (uddiyãna bandha); (3) neti, or the cleaning of the nasal passages with water and/or cloth; (4) trãtaka, or staring at a small mark or candle until the eyes water; (5) nauli or lauliki, in which the abdomen is massaged by forcibly moving the rectus abdominus muscles in a circular motion; and (6) kapãlabhãti, where air is repeatedly and forcefully expelled via the nose by contraction of the abdominal muscles…The texts promise miraculous results for the proper practice of these purifications, such as the indefinite prevention of illness and old age. The HYP names ãsana as the first accessory (anga) of hatha yoga and lists its benefits as the attainment of steadiness (sthairya), freedom from disease (ãrogya), and lightness of the body (angalãghava)…The text outlines fifteen ãsanas, some of which are credited with curative properties, such as destroying poisons…The GhS places the ãsanas after the purifications, and briefly describes thirty-two of them. The SS mentions that there are eighty-four ãsanas, but describes only four seated postures. The mainstay of hatha practice is prãnãyãma (also called kumbhaka, or “retention,” in HYP). Prãnãyãma cleanses and balances the subtle channels of the body (nãdi) and in combination with certain bodily “seals” or mudrãs, forces the prãna (vital air) into the central channel called susumnã or brahmanãdi. This in turn raises the kundalini energy, which is visualized as a serpent sleeping at the base of the spine. A little more explication of the “subtle physiology” of hatha yoga may be helpful here. According to these texts, the human body is made up of networks of subtle channels called nãdis. The SS numbers these channels at 300,000 and the HYP at 72,000. The entire process of satkarmãni, ãsana, prãnãyãma, and mudran aims at the purification and balancing of the nãdis. The two principle nãdis, ida and pingala, are situated respectively on the left and the right sides of the central channel (susumnã) and are identified with a microcosmic, corporeal moon and sun. Also of vital importance here are the famous cakras (“wheels”) or padmas (lotuses) of hatha yoga and Tantra, which are commonly numbered six and seven and which lie at intervals along the spine…They are intersected by idã and pingala nãdis. The serpent kundalini (also known as the goddess Sakti), lying coiled and sleeping at the base of the spine where all the nãdis converge (ãdhãra), is drawn up along the susumnã, piercing the cakras as it goes. The result is that the vital breath (prãna) becomes absorbed in voidness (sunya) and the practitioner attains the condition of samãdhi,…which in turn leads to moksa, or liberation. I’ve practiced quite a few different types of yoga, including hatha. I’d love to study yoga more in depth one day, maybe in India. There’s so many interesting things to learn, like the six purifications, cool stuff! Thanks for sharing. I have practiced Hatha Yoga many times. It is one of the most known and practiced styles. Liked the information shared!